The Enterprise-D Construction Project is an ambitious one-man project to recreate the Enterprise-D in its entirety using Unreal Engine 4, drawing from a variety of sources including both the official blueprints by Rick Sternbach and the earlier Ed Whitefire blueprints. By all reports the final model aims to reproduce all 42 decks of the Enterprise in extreme detail, right down to the ship's roving, 80's era house plants. The project isn't publicly available yet, but you can take a virtual tour showing off decks 1–4, including the bridge and main shuttle bay. The project is currently just a hobby for creator Jason B, but he's already considering populating the ship, offering a chance to explore the exteriors of stations such as Deep Space Nine, and maybe one day incorporating game mechanics. The creator is considering the possibility of crowdfunding campaigns to fund the project. Personally, I'm looking forward to finally seeing the aquatics lab and cetacean tanks, from which a group of Bottlenose dolphins is alleged to have assisted in the navigation of Galaxy-class starships. It's one of those tidbits of trivia that gets hotly debated by drunk trekkies in the parking lot of Star Trek conventions. 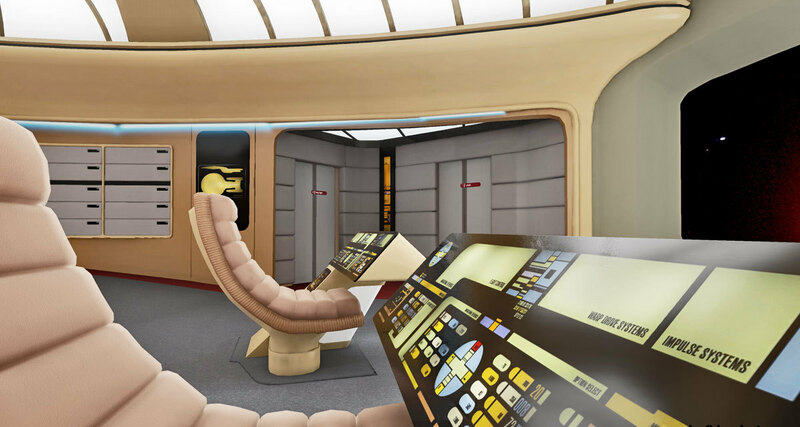 Take a short walk through a few decks of Star Trek's USS Enterprise from ST: The Next Generation. The ship is being created in the Unreal Engine, and is Oculus Rift ready!